BERLIN (AP) — Bayern Munich’s rivals appear to have thrown in the towel already. Bayern was supposed to have had a tough start against Hoffenheim, Stuttgart, Bayer Leverkusen and then Schalke, last season’s runner-up. But the team’s confidence is booming after winning every game comfortably since its loss to Eintracht Frankfurt in the German Cup final in May. “It can go on like that,” Bayern sporting director Hasan Salihamidzic said. Ominously for Bayern’s rivals, the Bavarian powerhouse has not lost during Oktoberfest for the last eight years. The 185th edition of the beer-festival in Munich started Saturday and will run until Oct. 7. While they may indulge themselves by wearing the traditional leather pants of the region, the players will have to resist the temptations of the jugs of wheat beer at the festival – at least until the last Sunday. “Until then they can maybe drink a radler,” Salihamidzic joked, referring to beer watered down by non-alcoholic soda. Bayern coach Niko Kovac said the players know what is expected of them during Oktoberfest. “If they go there, they will certainly be recognized and that won’t go down well. We’ll have time to go there, but now we still have to get points,” Kovac said. Bayern, which is going for a record-extending seventh straight title, next hosts Bavarian rival Augsburg on Tuesday, before traveling to second-place Hertha Berlin on Friday. A win against its closest rival could see Bayern open up a five-point lead after six matches. Hoffenheim said it was shocked by the animosity displayed by Borussia Dortmund fans toward its billionaire backer, Dietmar Hopp, in the 1-1 draw on Saturday, when fans displayed what the club called a “death threat” against him. 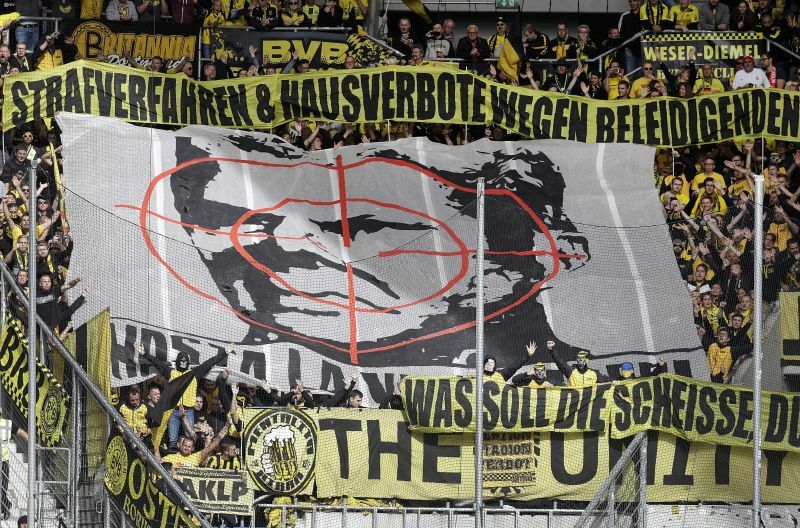 Dortmund fans rolled out a huge banner showing Hopp’s head in crosshairs over the words “Hasta la vista, Hopp” across a large section of the guest block at the stadium in Hoffenheim. A similar banner, only much smaller, caused a stir 10 years ago. Dortmund chief executive Hans-Joachim Watzke apologized for the banner. Hopp is a target for Dortmund fans after initiating legal proceedings against more than 30 of them for alleged obscenities during a game last season. It took some time, but Ondrej Duda finally seems to have arrived at Hertha in his third season at the club. The Slovakia midfielder sealed the 4-2 win over Borussia Moenchengladbach on Saturday, taking his goal tally to a league-leading four in four games. Duda only made three league appearances – 67 minutes altogether – in his first season at Hertha after joining from Legia Warsaw in 2016, while he scored one goal in 17 appearances last season. Mario Goetze, who scored Germany’s World Cup-winning goal in 2014, has yet to play for Dortmund in the Bundesliga this season. The 26-year-old Goetze was left out of the squad altogether for the game at Hoffenheim, a decision that coach Lucien Favre said was purely sporting.